U.S. humanitarian aid destined for Venezuela was being prepared at a warehouse on the Colombian border Friday, as opposition leader Juan Guaido assured his desperate countrymen that supplies would reach them despite objections from embattled President Nicolas Maduro. 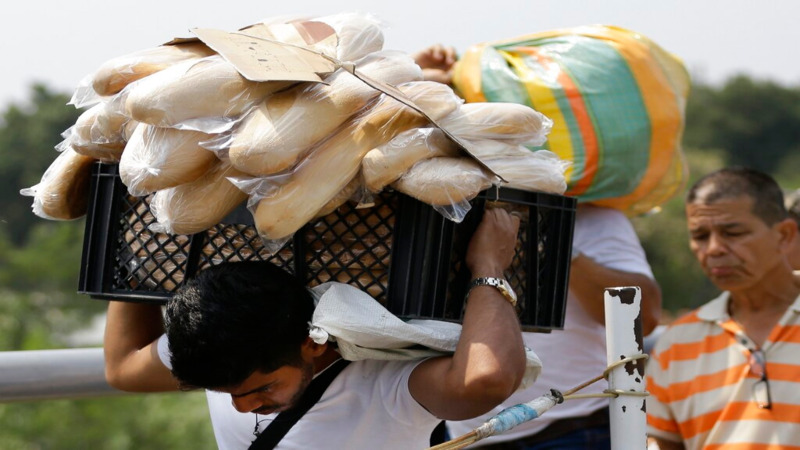 The goods, including packaged corn, flour, lentils and cans of tuna, arrived a day earlier at the Colombian border city of Cucuta, just across the river from Venezuela. On Friday, volunteers were busily filling white sacks with the items from boxes marked with the words "USAID." "It is already a fact that humanitarian aid will arrive and will be reaching the most vulnerable," Guaido said in a videotaped statement — giving no firm timeline or plan for how it will cross. The emergency supplies have become the focus of Venezuela's political struggle between Maduro and Guaido, who declared presidential powers in late January, accusing Maduro of being illegitimate following an election last year widely viewed as a sham. Maduro remained dug in Friday as he spoke at a news conference at the government palace where he accused President Donald Trump of orchestrating a coup. "There's an attempt to violate our national sovereignty with this 'show' of a humanitarian operation by the government of Donald Trump," Maduro said. Maduro denies a humanitarian crisis exists and says Venezuela is not a country of beggars. 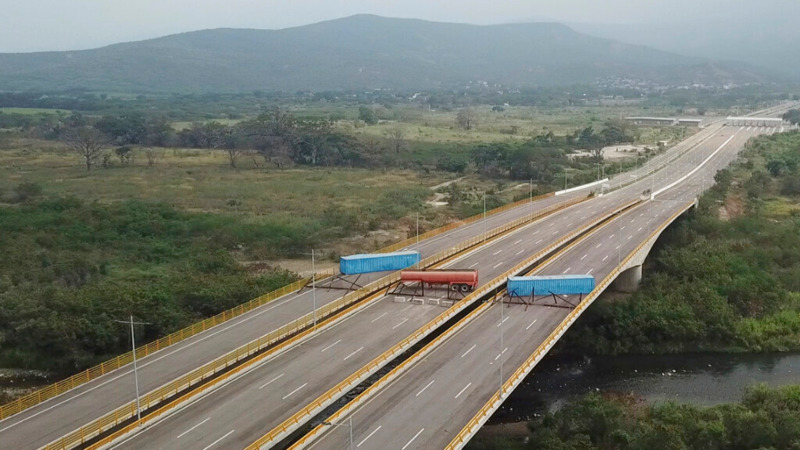 The Venezuelan military has barricaded a bridge connecting the two nations with a tanker and two cargo trailers in an apparent attempt to block the aid. U.S. 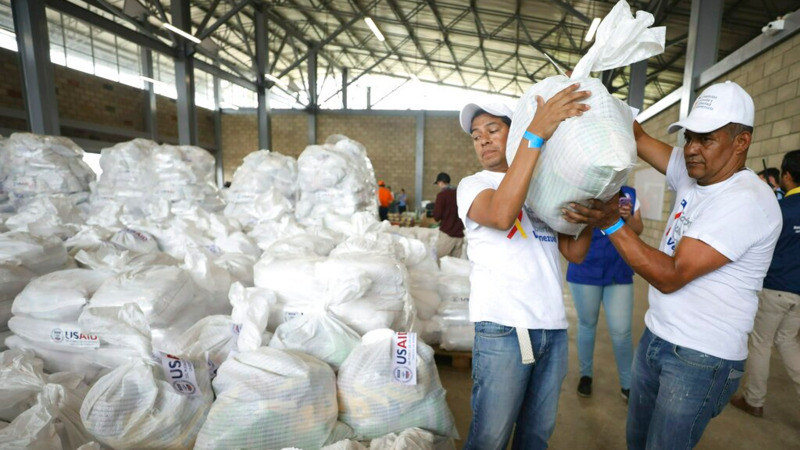 Ambassador to Colombia Kevin Whitaker said the aid was just the first shipment of what he called a "flood" of humanitarian assistance headed for Venezuela. It came in answer to the last 20 years of the country's disastrous management and corruption, he said. "We expect more to come," Whitaker told reporters in Cucuta. "This is a down payment. This is just the beginning. It's important. It's significant." Whitaker said the U.S. involvement stops at the Colombian border, where the Guaido-led opposition would be charged with distributing the aid inside Venezuela. Opposition lawmaker Lester Toledo, Guaido's representative in Cucuta, gave some insight into how the humanitarian aid would reach Venezuela, promising more details later. "I am convinced that the way we are going to pass this aid is through the Venezuelan people," Toledo told reporters. "People, people and more people bringing in humanitarian aid." A growing list of 40 countries has thrown their support behind Guaido. On Friday, Romania's president became the latest world leader to recognize Guaido as interim president almost a week after other European Union countries did so. President Klaus Iohannis said Romania decided to join other EU countries in recognizing Guaido partly because Bucharest currently holds the EU's rotating presidency. On Thursday, a coalition of European and Latin American countries urged Venezuela to hold free and transparent elections. Guaido declared himself Venezuela's legitimate ruler on Jan. 23, maintaining that the constitution gives him that right as head of the opposition-controlled National Assembly.